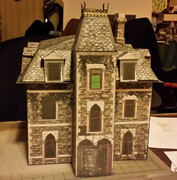 I came up with the Pike Funeral Parlor a while back, cardboard-warriors.proboards.com/thread/9077/pike-funeral-home, but I decided I would rather have it as a haunted house for the Halloween Wars. 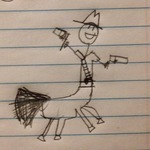 Version II is looking more promising. In spite of having skipped a part of my work flow. Generally, I arrive at a geometry and save a blank version. Did not do that for the funeral home, nor did I make one for the first version of the haunted house. I am going to do that next. But I do have most of the design elements and the stone texture and have the roof textures built. I found a stone wall that I duplicated over the page and then came up with an irregular stone pattern out of this to paste over places where the different sections looked squirrelly. If I had done my normal blank version, the change between version 1 and version 2 would have been painless. With more of a Haunted House shape, I decided I would like to use elements from the manipulated image above to flesh it out. As I proceed, it is looking more like the home of a cattle baron or an industrialist, rather than a Haunted House. I'm hoping to get an inspiration make it more 'haunted'. As far as the Industrialist's Mansion, all done except the retextured chimney. I think it should build up nice, just not spooky. ...I'm hoping to get an inspiration make it more 'haunted'. Actually, I was looking more at the Disney Haunted Mansions that look maintained, but haunted. Although I like the Ravensblight models, I think Ray goes a little overboard with the 'falling in' look. 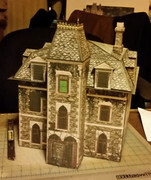 When I went to bed Friday night, I was thinking more of Dave's first WFRP models. A lot of mildew, a little repair and a bit needing repair. And some vines, too. I don't really have a clue how to create the mildewed look, but I have a little time to try to figure it out. I'd be greatly appreciative of a few nods and winks on how to proceed on developing that mildew look. First thing I need to do is finish the Industrialist's House. Then I will make the Haunted House version of it. I think I am down to the chimney and doing the test build. Yep, I just am a little unsure of how to do a sufficiently convincing representation of the mold and mildew. I've retextured the chimney, but haven't got the correct angle worked out for the chimney base. That's going to have to wait for the test build. The roof has two angles, steeper near the edge and shallower around the peak. I have the angle of the steeper portions, but I think the stack should be further away from the exterior wall. It's for a furnace, not a fireplace. The problem with mould and mildew is that unless the exterior is already damaged, almost all of this happens on the inside of rooms, not the building exteriors. 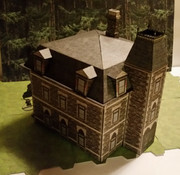 You can get lichen and moss growth on the outside, but that happens in less polluted areas anyway, so wouldn't look especially "haunted house" on its own. Basically, I still think you're needing a less maintained look overall. Otherwise, it's just a house. Just holding the gables and gable caps up to it by hand looks good with the caps and without. Thanks. It reminds me of several buildings. Without the gables, it reminds me of some old schools and hospitals. I think a cattle baron would have double-decker porches on a couple sides. I am tempted to design a couple wings to make it more mansion-like, but that will be another day. I should finish the gables, railing and chimney tonight, but then I will have to adjust the files for the chimney on this version, the funeral parlor and the eventual haunted house. I am somewhat torn. I could take the industrialist house and Starc-ify it, like Ray O'Bannon's Starc Manor, ravensblight.com/StarcManor.html . Basically, blacken windows and remove part of the frames, then add some cracks and missing stonework, and finally, add wear to the roof. Maybe some vines. Or, I could take the Pike Funeral Parlor, cardboard-warriors.proboards.com/thread/9077/pike-funeral-home, and 'Ghost House' it, ravensblight.com/GhostHouse.html, taking the same approach. The siding would require a bit of grunge. My thought is to desaturate some wood texture, making it more gray. I will then overlay on the existing siding, adjusting opacity, so that some are darker than others. Then start making holes with some studs showing. Gables are on and the chimney is worked out for the test build, but I'm not going to get to adjusting the files tonight. Gotta keep it off the building until after the files are set. 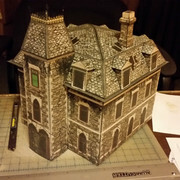 Maybe at lunch tomorrow I can get the files fixed, glue the chimney on, take a photo, glue the gable caps on, and take a photo with that version. I still need to play with the new roof textures, but I think it looks promising. Sounds like something the god of storms would say. I haven't worked on the weathering yet on the roof. I was going through the files, with an eye for changing the basic structure of the model to make it easier to build. And re-numbering parts so that things make more sense. And then how the numbering should be if I change the parts. A lot of work with not a whole lot to show for it. But the tower is tricky to position because it is wobbly. Making the tower roof separate, with top and bottom caps on the tower, will make it easier to position. Only now that I think about it, the tower should have a back to keep things rigid and square. But card thickness would have to be accounted for. The gables could also benefit from a back panel to maintain squareness. Due to the size of the wall panels, I'm considering changing the top and bottom tabs on the walls to something similar to what Mauther does on his buildings. It helps to keep building walls square. Last night I worked out the new parts and started on reformatting the pages. Finished it up over lunch and after work. I've decided that the roof will work as is without additional weathering. It's always a matter of deciding when to stop, and I think it is time to stop. I think I need to move on to other projects. Watching the Blues Brothers right now and ideas are flying. I was thinking about formatting this for the Hoard over lunch today, only it isn't cutter friendly. So, should it be reduced by about 10%? Should I post 'as-is' knowing that parts will overlap the areas that cutters won't be able to handle? My gut reaction is that it should stay to scale and have a bit of manual cutting. If you can manage that the stuff that must be hand-cut are straight lines, that would be best. There is no reason the tabs can't run right to the edge of the page. No curves on this one at all. The gables run over, the walls and roof sections run over, but not by that much, and generally it's the tabs that run over. Egg Shen's bus is being a pain in the neck, so I might as well build the Haunted House. Printed, so it's time to score. My new part numbering should make things real obvious. 1-1 glues to 1-2, 1-3 to 1-4, then the two halves glue together. 2-1 to 2-2 (the red dot marks the front), and that gets glued to part 3 which gets glued to the top of the 1's, etc. So, this build will not have the threshold, but it will be on the files. I'm not happy with the missing windows. They just don't show up well enough. The holes in the roof are near black and look much better. I'm thinking I should use the 'near black' for the missing windows. Opinions?